While we are manually removing leaves and cleaning the eavestroughs and downspouts of debris we take careful notice to ensure the eavestroughs/gutters, roofline and downpipes are in good order. When the winter is over and the spring arrives is a good time to get the eavestoughs ready for the summer rains to avoid any potential flooding and leaking of water into your basement. Go outside and take a look around to see if there has been any winter ice or water damage to the exterior of your home. In the fall before winter, ensure you have the gutters/eavestrough and downspouts cleaned thoroughly. Keeping the eavestroughs or gutters clean is the first line of defence against damage to your eavestrough and roofline. Several things can cause blocking of your eavestroughs and water will not be able to reach to the downpipes so to be removed from the house. It is very important to up keep your home especially cleaning your eavestroughs 1 to 2 times per year. Drainage issues are the #1 cause of basements from leaking. Not properly routing/directing your downspouts away from your house can cause serious damage and unwanted costs of waterproofing your basement. In the event of this unfortunate situation and if you have water in your basement it is most likely due to overflowing eavestroughs that are clogged. A clogged downpipe or a downpipe that is positioned too close to the house will certainly cause water to leak into the basement. If you have water leaking into your basement, this is an eavestrough/911 -emergency situation. Call us and we will determine the problem and solution, before you spend money on waterproofing. Clogged eavestroughs and downpipes can cause severe water damage due to leaking to your home and several parts of your property. A roof could potentially leak, or water could drip down the sides of a building, cracking windows or damaging the walls with mold or mildew. In addition, excessive water can cause cracks in the foundation of your home or flooding to a basement or lawn. These are all very expensive damages to repair. While your eavestroughs ideally should be cleaned three to four times a year, it is especially important to have the eavestroughs cleaned during the fall and spring at the very least. Fallen leaves, twigs and debris are the prime culprits in blocking eavestroughs and causing clogged downspouts. These are also invitations for birds and rodents to make nests and homes in tyur eavestroughs that could lead to an infestation of your home. Regular cleaning of your eavestrough is also required especially as a means of protection against west nile virus, because 60% or more mosquitoes come from clogged or badly sloped eavestroughs. While many people decide to clean their eavestroughs on their own, it is best to allow the professionals at complete eavestroughing and roofing services to take care of cleaning the eavestroughs/gutters. When you have your eavestroughs cleaning done with us, we do a cleaning and inspection so that if cleaning is not the solution to the problems you are seeing(overflowing of water, water sitting in the trough or detached eaves)we will inform you so that you do not have to pay additional dollars later. Because with our eavestrough cleaning we offer a discount on the cleaning cost if cleaning alone will not resolve the problem. There is also a package deal available for eavestrough cleaning and repairs. If cleaning is not done correctly, there is a high chance of injury, due to slippery ladders or loose gutters. Having your eaves and downspouts cleaned with us will ensure a thorough professional job is done, including unclogging the downpipes and taking them apart if necessary with no added charge. We provide you with a written inspection report as to the state of the roofline (eaves and edge of roof) the feedback we provide is that which only professionals with our company can give you. The professionals at complete eavestroughing and roofing services can answer all your questions regarding your eavestroughs and roofline and tell you if you need eavestrough repairs. We can provide the best professional advice on your eavestrough issues including whether you need a replacement or whether dollars can be saved with a comprehensive repair package. Clean out - a sturdy ladder with covers is used to protect the eavestroughs from damage. The ladders features are designed specifically to place the technician at the perfect distance from your gutters without resting or leaning against them. All precautions are taken to avoid walking on the roof unnecessarily. Even if homes are close together the technicians are so skilled that they clean the sides thoroughly. The debris and leaves are manually removed carefully so as not to use force in cleaning them as if they are loose or the fascia is weak the whole eavestrough can come off. If you have gutter covers or screens and leaves have made their way underneath them, the covers should be removed before cleaning out the eaves, to ensure that they're thoroughly clean. 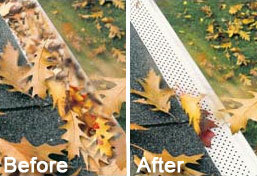 Leaves, sticks and all other debris are carefully removed from your gutters and roof. This wet mulch may have already begun to decompose in your gutters. The debris is bagged as yard waste or trash or you can add it to your compost pile. Stubborn debris may require a tool, like a barbeque brush or broom, to remove. Once the gutters are debris-free, a garden hose can be used to rinse them. (Optional) this method is also useful in finding leaks or detecting clogged downspouts. A high pressure stream of water may be able to remove clogs, but it may also take shaking the downspout or even using a snake and or broomstick to remove it. Now the eavestroughs are ready for leafguards to keep them free from debris all year long year after year. Complete eavestroughing carries professional quality leaf guard systems that will give your eavestroughs the protection needed during the spring and fall and will strengthen them in the winter from ice and snow. If eavestroughs become too heavy with debris, they could potentially break, making it necessary to replace or repair them. This will cost you money and damage your roof line in the long term. Note: all above can be compared visually to similar products purchased at home depot or hardware stores, but then there is no comparison in terms of guarantee to work and last in the Canadian climate as these products do. We have chosen the best there is on the market. The best way to safeguard your home and make your house maintenance free is to install a gutter guard system that prevents leaves from entering your eavestrough and clogging up your downspouts. When choosing a gutter guard system that is suitable for you home there are many factors and variables that come in to play. What types of trees are surrounding your home (ex. Pine needles, maple leaves). The density of the leaves (ex. A lot of trees) water and ice damning issues in the winter. As there are many gutter/leafguard guard/eaves protection systems on the market it can be confusing to know which is best for your home and budget. We at complete eavestroughing have checked out the best and most professional quality so that when you have them installed by us you know you are getting a quality product that will do what it is supposed to do. "Eliminate eaves cleaning forever"
Complete eavestroughing and Roofing Services will expertly advise you on which type of leaf guard system is the best for your home. Combinations of different systems can be used to achieve the best results for your budget. With our spring and fall discounts which include free cleaning as part of the installation, why not have the real thing to save you money and time. Not to mention peace of mind. "PROTECT YOUR EAVESTROUGHS SO THEY CAN PROTECT YOUR HOME"